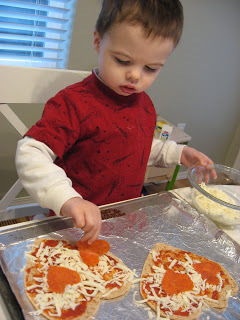 Making heart shaped pizza is the perfect cooking activity for young kids! It doesn’t require you to be near a hot stove and they are practically a shoe-in, even for picky eaters. My son has recently started picking everything except meat and cheese off his pizza so I blend carrots and peppers into the sauce. Mama always wins! 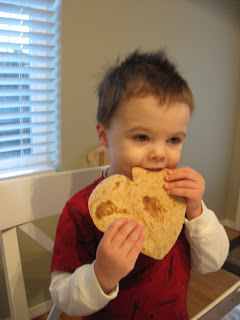 Also using tortillas makes it easy to shape the crust into a heart. Gather your materials. 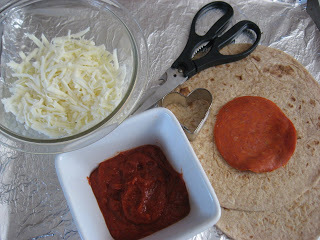 You will need a pan, oven, tortillas, pizza sauce, pepperoni, mozzarella, kitchen shears, and a heart shaped cookie cutter. 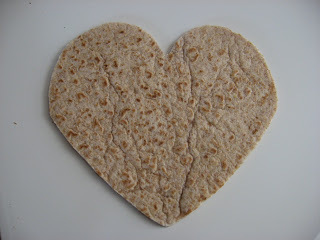 Start by folding your tortilla in half and cutting it into a heart. 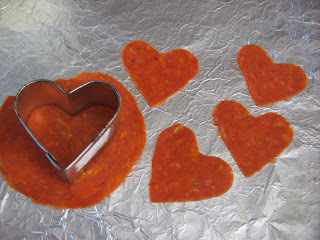 Next, using the cookie cutter, make your heart shaped pepperoni. 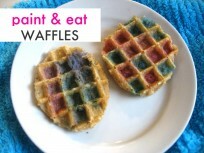 You could do this with a host of other toppings as well. Time to gather the kiddos! Mine was a little hungry after his nap and decided to taste test the crust. Spread the sauce on your heart shaped crust. Add the cheese. I am not sure if he is putting it on or taking it off in this picture. 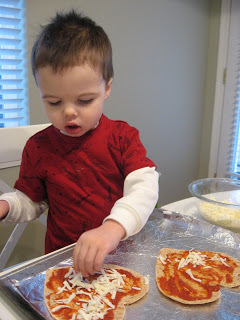 Shred much more than you need if your little chef is a fan of cheese! Add the pepperoni! My son insisted the hearts were eyes, so we made a mouth too. Bake- I baked our heart shaped pizza at 400* for about 10 minutes, checking on it often. 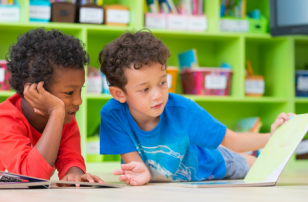 Do you do something special for or with your kids on Valentine’s Day? Tell us about it in the comment section! 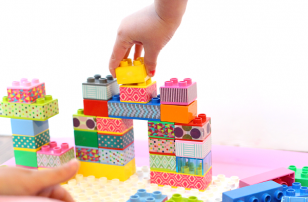 Previous Post: Naptime Creation – La la la ! Allie… we have no school on Friday and we are SO having Heart Pizza for lunch! Aw, the playdoh would have been great for school valentines. Oh well, next year! Thanks again for all the great ideas! 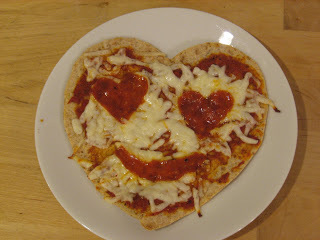 funny I made heart pizzas for dinner the other night. 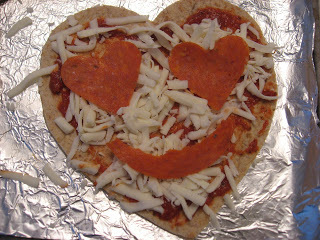 Funny enough heart pizza’s were on the menu for today’s lunch! I am doing it with english muffins though. Maddie asked for heart cheese toast yesterday (grilled cheese) so it has been a week of heart foods! I love how we all think alike ! Sandy I just popped over to see what you used for the chocolate playdough and saw your I love you cards, could those be any cuter? That is so cute! What an idea! Thanks…. I can’t wait to do that with my 3 kids. So much fun…. I LOVE the heart pizza!! SO CUTE! I’m going to do that for sure! 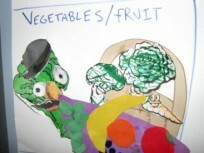 Smart to sneak in the veggies too! I’m presenting you with a blog gift in my blog. It’s in portuguese though… I can tell you more about it later, if you wish. It’s a gift-giving between blogs and I really wanted to recommend yours. It’s very entertaining and I learn a lot from your experiences. We did this for my girls in kindergarten. It was fabulous. This year we are giving stress balls made from balloons and flour with a tag, wishing you a stress free Valentine’s day! 🙂 My girls are a tad bit older now. This was not mushy and almost ‘cool’. 🙂 Happy day! 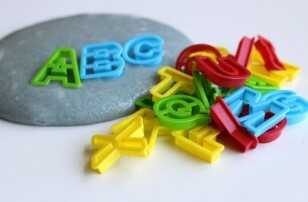 Awesome idea about giving away playdoh. Why didn’t I think about that earlier. Great ideas!!! I love your blog. A friend introduced it to me. I’ll be looking often for great ideas! Love the pizzas, added it to my grocery list today. We usually have a pizza-picnic-movie-night in the living room once a week, this will be a fun surprise for this week. OMG! He is getting soo big! He is just too cute! 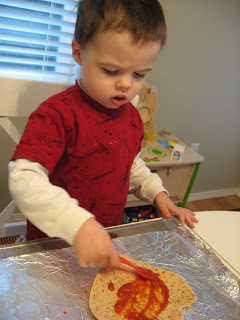 looks yummy we made quick and easy valentines cookies you might like to do with your LO! we are making your pizza tomorrow! will link to you if that is ok! Jolene- I know I am in denial, we have preschool open houses soon, it all goes by so fast! Allie — we made Flubber today, pink of course for Valentine’s Day — for the older two to give away. But Alexander had SO much fun making it and playing with it. You guys would too! I just added that recipe on my blog as well… I spent the whole day making and packaging Valentine’s Day party stuff! I am so glad to be DONE with it! But… now the baking!!! 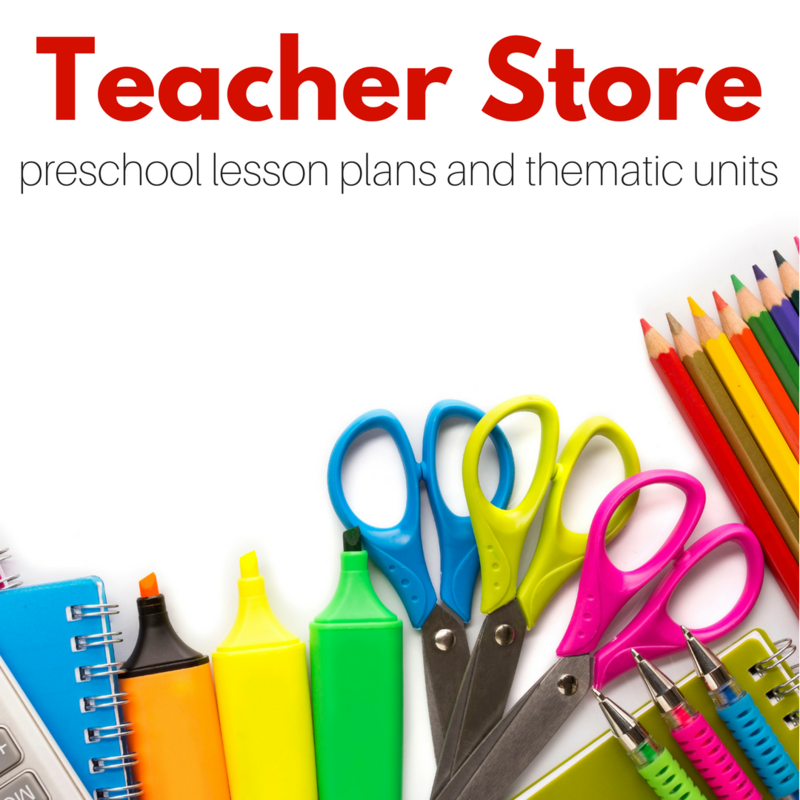 Oh don’t worry his preschool will be only a few hours a week, still lots of time to have fun with me at home ! I did a variation of this for my boys!!! You can check it out on my blog!! Thanks for the great idea! 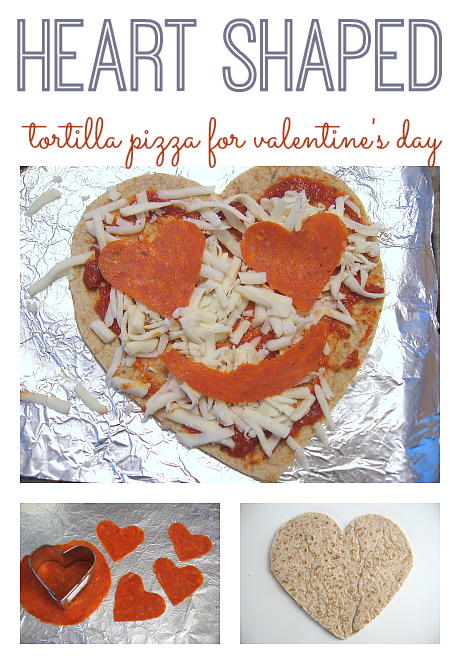 Excellent idea – heart pizzas for lunch tomorrow! .-= Kristin´s last blog ..Special Valentines – hand print heart =-.